Just a little bit about me so I can tell you how I know so much about treating acne. I was mostly blemish free throughout my teen years much to my surprise. It was later on in life when my skin took a turn for the worse. When I was about 24 years old I was taken off birth control. Low and behold, I had no clue that those tiny little pills were keeping my skin clear! I was ok at first. But that was because I was pregnant - bonus for ME, pregnancy = clear complexion. *This theory has been tested 2x and runs true for me. After my pregnancy that is when all kinds of **** broke loose on my face. After a few years of horrible acne I decided that I HAD to have professional help. Off to the Medi-Spa I go. I was graded at a level 3 (out of 4) so even though I didn't have much in the way of cystic acne or swelling, I had so many of the clogs (white/black...) that I was moved from 2 to 3. Well lucky me to earn a higher grade. Boo. So I started my treatment. I went into the office about 2x per week to receive microdermabrasions mixed with chemical peels (TCA mix) and some light therapy. Well, at $300 per week and no big improvements happening after months, I took my empty checkbook and headed for the hills. But I wasn't down for the count. I started my research on the construction of peels and how they could help my skin. I also found out that a simple weekly treatment could NOT change my skin - I had to do work at HOME too. That is the downfall of many offices, they don't recommend what to do at home. Since you spend the majority of time treating yourself, you NEED to have something to work with. ... ding! That was my clue! This was my turning point. Investing in dermatology books, esthetic books, business books and more I decided that I was going to make a career change! Thank you Design Degree, but I have to move forward with my life into something that is more in line with helping myself and others. I decided on what products I needed to begin my journey and found a chemist who understood my values and my goals. Everything has to be 100% non-comedogenic and beneficial for Acne and Anti aging first and foremost! A true line built from the bottom up to HELP people get what they need. *The professionals know what you need, but instead of helping you control your issues with PREVENTATIVE products they would rather treat you over and over again when issues flare. *Not all of them, but indeed a great amount. So here I am now 14 years later and I know a thing or two about Acne, Anti aging and even Scaring. But since this article is about acne, let's focus on the products that I find work BEST. Here is a great little basic regimen to get anyone started in controlling their acne issues. A home treatment that works FAST! Wash with our AB Cleanser. Salicylic, Glycolic and Lactic acids WORK to exfoliate the extra skin that can clog in the pores. Pat dry skin and follow with our Purify Advanced Toner. Mandelic, Phytic and Citric acids work - not only to aid in exfoliation - but to control bacteria. Allow Purify to dry and apply Vitamin B Complex cream. Vitamin B is AMAZING for acne prone skin types (really any type of skin issue). Follow the same protocol (AB, Purify) then top that with Retinol .10% (for beginners, we also have .20, .30, and .50). Vitamin A is essential for teaching our skin to heal quickly (blemishes go away much faster when you use A each day), and it is also exfoliating and an antioxidant. These products are just the tip of the iceberg, but great for anyone looking to find Home Acne Treatments that Work - and FAST! Here are a few more suggestions to expand upon the basics listed. Add on a Mandelic Peel or a Salicylic chemical peel every week or two. A professional Home Peel will really remove the dead skin and bump up your program intensely. Exfoliating Scrub: Acne Diamond Dermabrasion Cream. This can be used 1-5x per week to INSTANTLY remove dead tissues and clear pores. CLEAR: Benzoyl peroxide. Benzoyl is liquid oxygen in a bottle. Excellent if the cause of your acne is from P-Acnes bacteria. Unsure? Then use it every other day anyways. Read about all of these products on our Acne Treatment Section of the website. 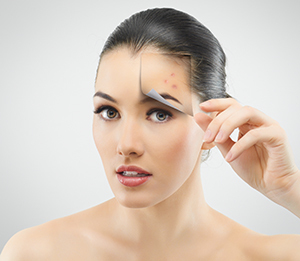 It has been my pleasure to walk you through these ideas to treat your acne at home. These products work! Do you still have questions? We are here Monday - Friday from 9-5EST. Call us 1-800-917-3155 or email us certifiedpeels@gmail.com. You can even CHAT with us right on the website. See the Green tab on the left? Click it.